In a report, CLW said it sent an undercover investigator into the Shinyang factory in June this year, and uncovered five child workers (under 16 years old) by just the third day, with evidence of more in subsequent days. It noted that Shinyang hired child labor and underage student workers during the busy season as it was in urgent need of labor. The minors were said to work 11 hours a day for about three to six months, without getting overtime pay and social insurance. 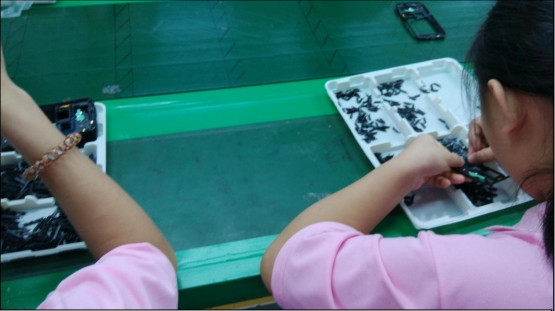 China Labor Watch issued this photo in its report which purports to show child workers at a Samsung supplier’s China factory. CLW also pointed out at least 15 sets of labor violations at Shinyang — including unpaid overtime wages, excessive overtime, the absence of social insurance, a lack of pre-job safety training and protective equipment, overuse of temporary workers and poor living conditions. Samsung told TNW that it has a strict “zero tolerance policy” on child labor and it routinely conducts inspections to make sure its suppliers follow such a commitment. “For the supplier in question, we have conducted a thorough audit in March 2013 which was followed by a third party inspection in August 2013, and yet another one in June 2014. No cases of child labor were found during these audits,” Samsung said. This isn’t the first time that CLW has brought forward such accusations — the latest allegations come nearly two years after the watchdog claimed to have exposed child exploitation in a Samsung supplier factory. The Korean company had subsequently carried out an audit and announced “corrective measures” of working conditions at its supplier companies, though it said it didn’t find any instances of child labor. Samsung, however, noted that it has demanded its suppliers adopt a new hiring process to boost identity verification starting late 2012, and introduced a facial recognition system in April this year. It also said that it had announced a Child Labor Prohibition Policy in China on June 27.